This was the infamous two part Pluto-Him parademon storyline. I would think Kirby was getting fed up with Lee and the interuption to the Galactus storyline, so he might have done it...but because it doesn't fit the story, I suspect someone else's hand...like Colleta, or someone ghosting for them. Somehow I can't see Kirby doing this. He was saluting the soldiers, paying them tribute. The peace sign doesn't fit that. I don't think the insignia were simple mischief. 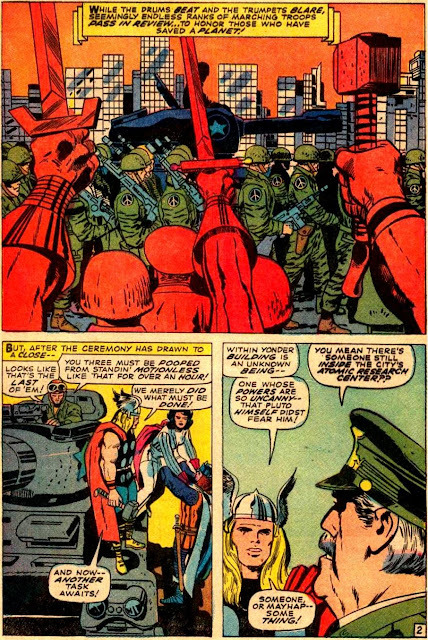 Kirby was pro-military, but I've read that he was anti-Vietnam. It is possible to be both. His concern about the possibility of Nuclear War (which haunted America during this period) can be traced back to the Duke of Broadway and as far ahead as Kamandi.